To test the JSON Server and Agent Solutions created in the two preceding exercises. 1. 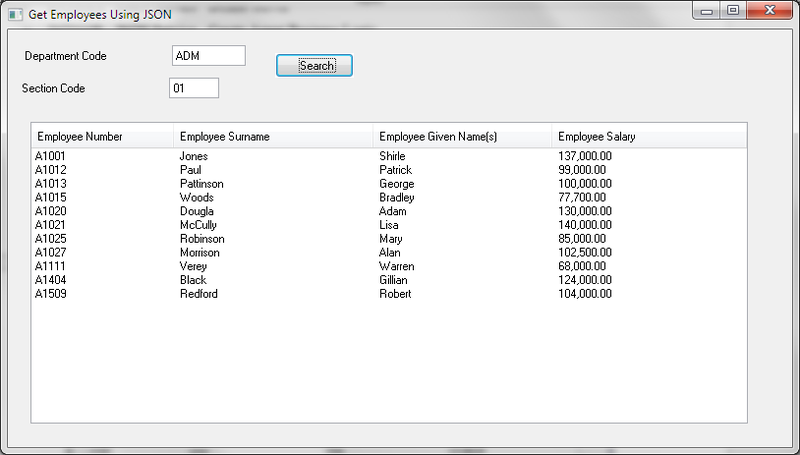 In Visual LANSA, locate form iiiFRM05 that you created in the previous exercise, on the Favorites tab. 2. Right click on the form and select Execute to run it. 5. Check your results are as expected, when you leave both department and section blank, and when only department is specified. 6. If errors occur, remember to use Integrator Studio to open the server and review the trace files. You could also run the form in debug mode, if necessary. You have now successfully completed the building of your LANSA Integrator JSON Server & Agent Solutions. What you have built and LANSA Integrator has generated is the code necessary to handle all the protocol and format details of receiving and responding to web service requests, of unwrapping and extracting the parameters and of building the JSON response.